These Norfolk videos will give you a little taster of some of the true delights that Norfolk offers you. A county with such an abundance of wildlife, culture, amazing coastline, castle and abbey ruins and incredible stately homes, there is so much to see and explore in Norfolk that you are spoilt for choice. 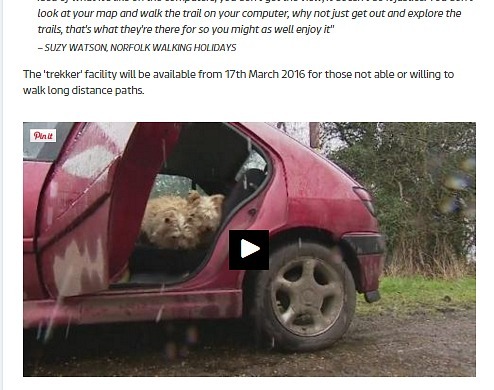 Norfolk Coast Path and Peddars Way will be Google Street Viewed. Every year the growing number of grey seals come and colonise on Blakeney Point in North Norfolk and Horsey beach on the east coast of Norfolk. 2015 was a record year for seal pups. Blakeney Point is managed by the National Trust and the seals at Horsey are monitored by The Friends Of Horsey. The season is from November to the end of January and it really is a sight to see. You have far more access to actually see the seals on the beach at Horsey, but a boat trip to the spit at Blakeney Point is also an excellent way to see these incredible mammals in their natural habitat. This video is courtesy of Darren Cook who has put together a lovely video on walking to Blakeney Point. This can be a tricky walk, especially if the tide is high, as it involves a lot of shingle. Blakeney Point is also a nature reserve, so if you are taking your dogs, please keep them under control at all times, as it's an important nesting ground for terns, as well as the seals. This is one of the Norfolk Videos that showcase Blickling Hall, one of the most magnificent Jacobean houses you'll come across in Norfolk, and maybe in the UK. Set in the beautiful surrounding of the park and gardens, it's a real taste of "Upstairs, Downstairs". With the butlers and servants living below, and the family living in the splendour of the many extravagant rooms, you get a feel for how life must have been. 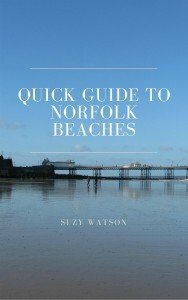 This is one of the best child friendly Norfolk beaches on the North Norfolk coast. With a massive expanse of sand and sky, nothing beats Wells beach. There are so many beaches in Norfolk, about 50 in all if you pick all the little tiny ones too. And the fascinating thing about them is that they vary so much. The beaches on the east coast of Norfolk, such as Gorleston or Walcott, or even Happisburgh, are not nearly as big as the ones on the North Norfolk coast. The Norfolk Norfolk coast has beaches which span out as far as the eye can see; Holkham, Brancaster and Burnham Overy. Or you have the wonderful and busy Victorian seaside beaches such as Cromer beach and Sheringham. So many to choose from, they world's your oyster! Oxburgh Hall is a stunning example of a Tudor mansion, one of many stately homes dotted around the Norfolk countryside. As with so many of these houses, the interiors and gardens are beautiful, we are so lucky to have these here in Norfolk. We are so lucky in Norfolk to have so many stately homes. Blickling Hall is my absolute favourite, but with Sandringham House and it's royal connections, and Houghton Hall and Holkham passed on through generations and still lived in by the current custodians, history comes alive in Norfolk when you visit these amazing historical houses. This is one of the most amazing spectacles you will ever see. It's just like a magic trick, or it's like those gymnasts who perform with the ribbon attached to a stick (sorry, not sure of the technical name!). Nature is an amazing thing, and RSPB Snettisham wader spectacular provides one of life's true wonders. The Snettisham Spectacular is just one small part of what makes the county of Norfolk such a special place for bird watching. With the NWT Nature Reserves such as Cley Marshes, and the RSPB sites such as Titchwell, Norfolk has an abundance of places you can visit, walk and tour. And don't worry, I will be adding more Norfolk videos, why not bookmark this page, and also visit my Photos of Norfolk Gallery.